Mr. Larry Lim, Managing Partner of Summerhaus D’zign, is a fine example young aspiring entrepreneurs can look up to. He gave up a corporate career and hand crafted a business from scratch to a rising industry star seen alongside with the industry’s leaders. Life had not always been a smooth sail for Larry who grew up in an average Singaporean family. During his teenage years, “The teachers didn’t have high hopes on my future” recalls Larry who was a playful kid in school. He completed secondary school with a GCE N levels certificate and furthered his studies with a private school to graduate with an Advance Diploma in Business Administration. Between his studies, he took on temporary administrative assignments to help pay for his studies. Subsequently, he enrolled himself into a part-time a degree program in business and marketing during his national service. His first job had him doing outdoor sales, selling internet broadband packages on the streets and door to door. “I was standing outside the train station, waiting for passengers to alight before walking up to them to convince them to sign up the internet packages…” described Larry during his one year stint in that company. He chanced into the banking industry starting off as a Personal Financial Consultant in a local bank before moving to a global bank as an acquisitions executive. Hard work got him promoted to be one of the youngest Relationship Manager in the bank before moving on to other banks later. “Like my peers, I was moving between banks thinking the grass will be greener on the other side. I got pretty tired after a while as I felt I wasn’t growing much professionally and personally.” He described his tenure in the banking industry. It was also then he decided to pursue his Master of Business Administration (MBA) with the Manchester Business School hoping he would be able to learn something and take on a different route upon graduation. On what made him changed his mind about climbing the corporate ladder, Larry said “I had the opportunity to talk to many entrepreneurs in the last bank I was with. I enjoyed asking them their stories and listening to how they grew from nothing, the challenges faced and how they overcome them. It was inspiring and I felt really motivated to be like them.” His wife had been in the interior design industry for almost a decade and the final push came when he convinced his wife to tap on her expertise in interior design and leveraging on his experience in the corporate world to build a contemporary interior design outfit. “I had to try… I don’t want to grow old to regret that I did not take the first step. Fortunately for me, it turned out well.” Larry said on the decision to give up his career in banking. Summerhaus D’zign was incorporated in June 2012 by Larry and his wife, Jess. The entrepreneurship journey was not always a bed of roses for the duo. As a new firm, new clients were sceptical of the stability of the company and doubted their ability to take on bigger projects. Many a time, they had to have their lunch and dinner in the car while travelling between different project sites. Hiring the right manpower was not an easy task as candidates would prefer to work in bigger, more established names. Fast forward 3 years, Summerhaus D’zign is now a cosy team of 6 and sales turnover crossed the $1,000,000 mark this March, just 2.5 years after incorporation. Summerhaus D’zign has recently been selected as one of the 50 leading interior designers in Singapore by Singapore Tatler Homes. 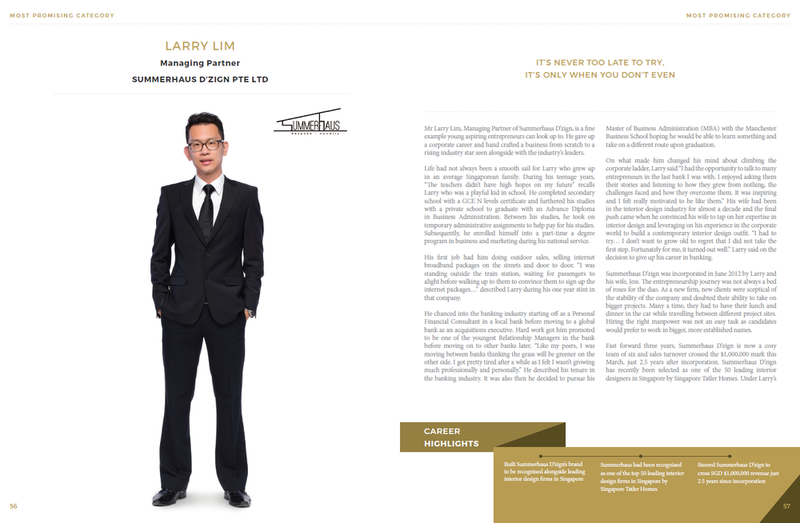 Under Larry’s leadership, Summerhaus had been featured in luxury magazines like The Peak, Singapore Tatler Homes and Robb Report. He is a firm believer of branding and is building up the Summerhaus brand name as the interior designer for private houses. This is exemplified through the continued partnership with luxury magazines to showcase Summerhaus’ projects. In the office, Larry believes that a strong and tight-knitted team is the heart of businesses. He adopts an open culture where everyone is encouraged to voice comments and constructively criticise each other’s work to push everyone to a higher level. Empowerment is omnipresent as he gives the team freedom to make decisions and involves them in management decisions too. On the culture at Summerhaus D’zign, Larry views everyone as an equal, “I told the team there are no “bosses” here. We are a family and everyone is equal, don’t call Jess or myself “Boss”. We are here to do our jobs and let’s give it our best.” Larry wants the team to “have fun at work” and encourages staff to listen to music and take occasional short breaks to refresh themselves. In the next 5 years, Larry wants to lay further foundation to Summerhaus D’zign’s brand position and he believes in growing at a controlled pace, not to be overwhelmed by exponential growth. He aims to attract more talents to join the team, taking it to a size of 15-20 at the same time giving management roles to current staff. Revenue targets will be five times of the latest turnover, to be achieved by taking on bigger scale projects like more bungalows and Good Class Bungalows. On market growth, he is targeting regional markets and has started by giving Summerhaus D’zign exposure in Indonesian luxury magazines. He will also like to take a step into hospitality design by taking on new boutique hotel projects as a start. Larry adds “A dream’s a dream until one puts actions necessary to realise it. It’s never too late to try but so if we hadn’t.” With visions already crafted, Summerhaus D’zign is poised to become a regional interior design powerhouse in the near future.